This really is a fabulous piece by hayashinomura. The simple background brings focus to the character, while the blue tone brings cohesion to the whole piece. 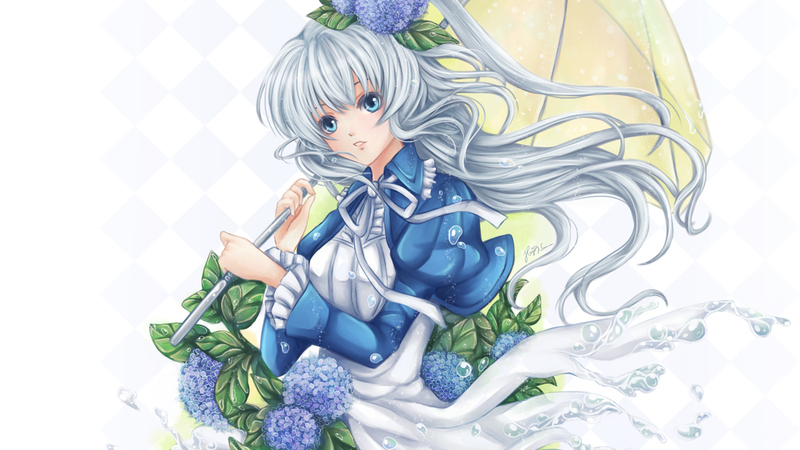 Lovely detail work on the flowers as well as the water droplets. Well done! wonderful piece, I also see it in your avatar, going to be faving this one as well, but there's just something about the sheer beauty of this, the detail, I can see why it was elited. One of my favorite things from you. Looks sweet. It's so beautiful. Your best work so far. I really like the highlights. Another lovely wallpaper from you, I love how you painted her hair, the way it flows so naturally. The light simplistic background brings focus to the character. My favourite part though is how her dress turns into water drops, as well as the way the water drops themselves are painted. shoot, ff got the upper hand on this highlight lol, I wanted to HL it too! And thanks for posting the video!